National Park Week - This Week! 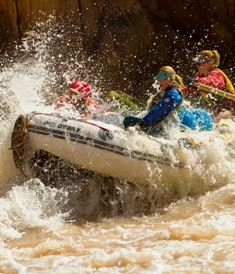 AzRA is now accepting reservations for the 2012 river season. The 2012 trip departure dates and prices are available online. You may notice, we have eddied out the prices for 2012 and hope both repeat and new guests will appreciate the price freeze. 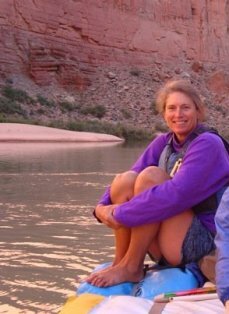 Sharon Hester, also known as "Shay" by friends and guests, has been guiding for Arizona Raft Adventures since 1982. One hundred and forty seven trips later, Sharon still loves being part of the transformation of uniting her guests with the Grand Canyon on trips. She enjoys exploring the side canyons and vistas, eating dutch oven baked chili rellenos, and bird watching. In fact, she always has her binoculars handy alongside her bird identification book for use by the guests on her boat. With her years of experience, she has many favorite moments on the River. She clearly remembers the high water years in 1983-1984 when the river flowed between 30,000-100,000 cfs. Another favorite experience included a 9-day solo kayak trip in April of 1990. In fact, if you would like to read a short story written by Sharon about her solo trip, click here. And more recently, an incredibly dramatic three day storm in October of 2010. She said the number of waterfalls associated with the storm was unlike any she had seen in her entire career. There are two public comment periods currently open evaluating the Environmental Impact Statements (EIS) on two controversial issues impacting the Grand Canyon: uranium mining and over flights. Public participation is important for developing a successful environmental plan. Therefore, we ask for your thoughtful evaluation and comments on the issues up for discussion at this time. 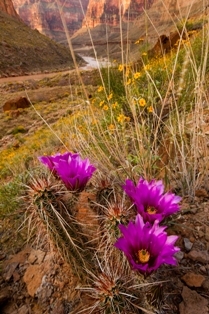 The Draft Environmental Impact Statement (DEIS) that addresses potential effects of withdrawing Federal lands from locatable mineral exploration and mining near the Grand Canyon in Arizona is now available for public comment and ends soon - the public comment period deadline is only a couple weeks away, ending on May 4, 2011. To read more about the DEIS, see supporting online documentation, and to submit your comment, click here. The second issue up for public comment is the Draft Environmental Impact Statement for the Special Flight Rules Area in the vicinity of Grand Canyon National Park to restore the natural quiet airspace above and around the Park. Although there has been progress under the previous regulations, they have not achieved substantial restoration of natural quiet. According to a recent press release, there are four alternatives for actions to manage aircraft over flight activity to restore quiet in the park. To read these options and provide your public comment, click here. The deadline for the public comment period is June 20, 2011.
cause changes or revisions in one or more of the alternatives. Guests who prefer the finer tastes of a beer chilled to the 55 degree Colorado River will likely be delighted to know there are several local microbrews now available in aluminum cans. Flagstaff beverage retailer Rich Stevens, at the Cork'n Bottle, has been selling beverages to commercial and private river trips for 28 years. He says the popularity of river runners purchasing canned microbrews has increased over the past few years. Although the cost of a microbrew exceeds the typical cost of a domestic brew, beer lovers enjoy having brew options which now include the Red Ale by The Lumberyard Brewing Company (Flagstaff, AZ), IPA and Amber made by the Grand Canyon Brewing Company (Williams, AZ), and IPA and Special Ale from the Ska Brewery (Durango, CO). There are benefits to buying local microbrews. For example, purchasing a product made by the community keeps local dollars within the community. In addition, microbreweries are notorious for keeping high standards for reducing their environmental impact and a philanthropic stance for giving back to the community in which they live. Finally, with gas price per gallon and an estimated one pound of carbon emitted per mile driven, brewing and selling locally saves in cost and environmental impact of transporting the product. If you are on a lower Canyon trip, new microbrew options are on the Beverage Order Form along with several non-alcoholic choices. If you are on a trip beginning in Flagstaff, the Safeway supermarket carries typical canned beverages including a couple local microbrews, and is within walking distance of the Radisson Hotel. However, if you seek a wider selection of canned microbrews, including those listed above, visit the Cork'n Bottle establishment located at 824 North Beaver Street. If you have any questions or seek the guidelines for what is provided and what you can bring, refer to the Frequently Asked Questions page on the AzRA website or call the office at 800-786-7238. Grand Canyon National Park staff and guides from Arizona Raft Adventures joined together last fall on the Colorado River Management Plan (CRMP) Mitigation Program trip. The goal of the trip was to help meet the objectives of the CRMP in managing river recreation impacts to resources. The CRMP mandates that both monitoring and mitigation work trips are designed to determine what impacts are occurring, how these impacts alter resource conditions, and how adverse impacts can effectively be diminished. The NPS and the Grand Canyon River Outfitters Association (GCROA), of which AzRA is a member, recently renewed their cooperative agreement to accomplish a variety of rehabilitation and maintenance projects at camps and attraction sites along the Colorado River. The trip last fall consisted of a variety of skill sets from restoration biologists, archeologists, recreation planners, trail crew, river rangers, and river guides including six AzRA guides: Somer Morris, Holly Gardner, Paul Giffin, Laura Fallon, Jeff Pomeroy, and David Edwards. One of the impacts addressed on the trip included vegetation damage. Vegetation damage is usually caused by social trailing and trampling of grasses, shrubs, cactus, and the biological soil crust, also tree, shrub and cactus damage from campsite pioneering or illegal firewood gathering, and tree and shrub damage from unauthorized and improper pruning at campsites and attraction sites. Projects included multi-day stops at Soap Creek, Kwagunt, Unkar Delta, Hance Creek, Deer Creek, and 202 Mile Camps. Another impact the group tended to were social trails. Social trails are made when excessive and damaging trails are found leading from the post dam riparian zones of camps and attraction sites to the pre dam high water zones usually identified by damaged soil crust, gully formation, broken vegetation, and compacted soils. The pre dam high water zone is home to fragile plants and biological soil crusts that are easily damaged. The last main objective of the trip was to address areas experiencing an increase in trail erosion. Trail erosion happens when weather and natural conditions wear away the trails and usually occurs when water runoff is captured within the existing trail resulting in soil loss. 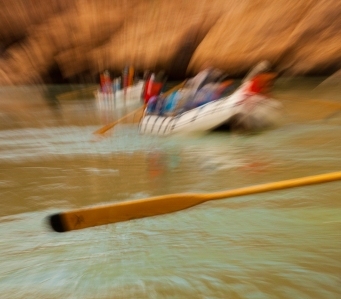 Make a charitable contribution to the Grand Canyon Wildlands Council this Earth Day and Arizona Raft Adventures will match your contribution dollar for dollar up to $100 per person! 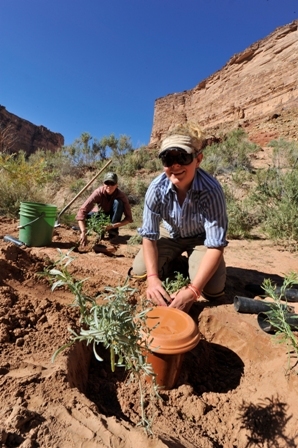 The Grand Canyon Wildlands Council focuses on habitat restoration and ensuring the existence, health, and sustainability of all native species and natural ecosystems in the Grand Canyon ecoregion. Donation must be from an AzRA guest (past, present, or future), post marked by Earth Day (Friday April 22), and accompany the following form. Mail donation and completed form directly to the Grand Canyon Wildlands Council at PO Box 1594, Flagstaff, AZ 86002. Thank you for your generosity and Happy Earth Day to everyone! 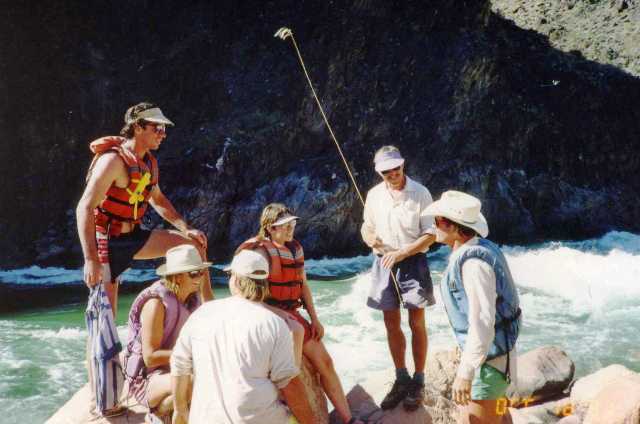 Thank you Mary Price for submitting this fantastic photo from 1991 featuring a classic group of AzRA guides scouting Crystal Rapid including Jon Hirsh, Martha Clark, Brian Peterson, Mary, Wesley Smith, and Dave Lowry. Thanks Mary for sharing! Before we close this issue of The V Wave, we would like to remind you AzRA has a Facebook page and a YouTube Channel. Our Facebook page features a Tip of the Week, photos, discussions from guests, announcements, and more. Our Youtube Channel features video clips and AzRA's five promotional clips.